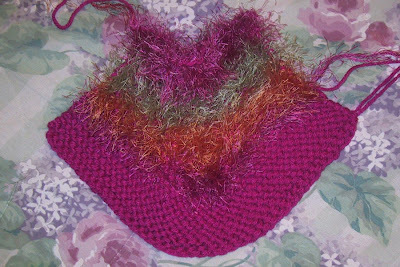 Thanks go to my friend Evie, of Evie’s Yarn Emporium in Longview WA, for allowing me to take liberty with a free pattern from her web site. Directions are for 6 (7-8-9-10-11-12) inch slippers. With double strand of worsted weight, cast on 44 (50-56-62-68-74-80) stitches. Work in garter stitch for 2 inches. Cut off one strand of worsted weight and begin knitting with one strand of worsted and one of novelty yarn. Knit the next row placing a marker between the center stitches. Row 1: Knit to within 6 stitches of marker, k2 tog 3 times, slip marker, k2 tog 3 times, k1, turn, purl 8, turn and knit to end of row. Repeat these 2 rows until 26 stitches remain, ending with purl row. Work in stockinet for 5 rows. Work 5 rows in k1-p1 ribbing. Bind off loosely (this is the cuff of slipper). Use size 11 needle to bind off. Fold in half purl sides together (the purl side is fuzzier). Sew bottom and back using one strand of the cast on tails for each seam. Bootie pictured is the 6 inch size, which is a children’s size 8. Ohh, I love these and would love to make some! I don't see the bootie pattern on the site anymore tho; is there anywhere else I might find it? Looks like the pattern is right there to these old eyes. 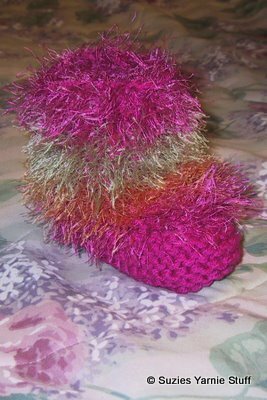 Do you have a crocheted version of these booties? No I haven't written a crocheted version. The "Kid and sasquatch Booties" pattern. I am wanting to knit a pair for my grandaughter who is 6 years old. As it is a surprise, can you recommend what size would I do? You need get her foot length. that's the only way to knit them the right size. Maybe you can get a parent to trace around her foot. They could say it's a present for grandma. She could color it and send it to you. Then you could measure it. also sharing in delicious. And obviously, thank you in your sweat!